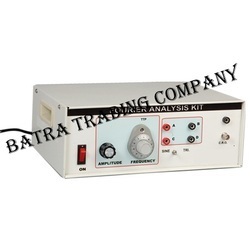 Pioneers in the industry, we offer ultrasonic diffraction apparatus, fourier analysis kit, verdet's constant appratus farradays effect, ultrasonic waves velocity in a liquid medium, digital rf oscillator and curie temperature kit from India. The instrument is designed to give accurate and best result, keeping inview the various difficulties faced by the students. 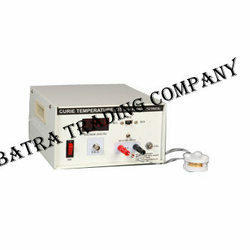 A high Power R.F.Oscillator is designed for this experiment and special type of high Resolving Spectrometer with Micrometer Eye-piece is provided for this experiment. It is fully tested & more fringes are formed with the help ofR.F. Oscillator. Direct measurement can be made on the micrometereye-piece and no camera is required. If a transparent isotropic material is placed in a strong magnetic field and linearly polarized light is transmitted in the direction of the magnetic field, of polarization of linearly polarized light rotates by an angle. In the present setup the optical activity of flint glass is investigated in a magnetic field. The angle of rotation of plane polarized light is proportional to the length (L) and magnetic field (B). Exp-1 Observing the rotation of the polarization plane when polarized monochromatic light passes through flint glass under influence of a magnetic field. Exp-2 Determining Verdet's constant from the relation between rotation angle and magnetic flux. Exp-3 Verification of the relationship between Verdet's constant and wavelength. To find the velocity of ultrasonic wave in liquids. To find the bulk modulus of the given liquid. To find the compressibility of the liquid. Objective: Determination of dielectric constant of PZT material with Temperature variation and thus determining Curie Temperature. Theory: Ferro-electricity usually disappears above a certain temperature called the transition (or Curie) temperature. Knowledge of the Curie temperature and the variation of the dielectric constant below and above the Curie temperature are of interest to the physicists and the engineers. 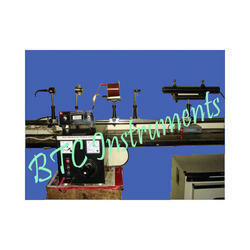 The dielectric cell DC is placed in PID controlled hot air furnace. The temperature of the furnace can be measured by inserting a thermocouple in a hole (provided on one of the Teflon discs), so that it touches one of the capacitor (metal) plates. By measuring VSC & VDC and using the value of CSC we can determine the capacitance of the dielectric cell containing the sample. 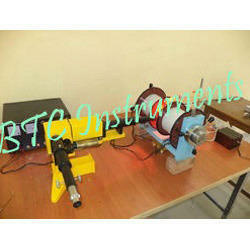 The Setup facilitates determination of dielectric constant of PZT sample at different temperature. Dielectric Constant increases as temperature increases, and near Curie temperature, it shows a steep increase and reaches a peak at Curie Temperature. Looking for Ultrasonic Labortary Instruments ?